World-renowned electronic music festival DGTL welcomes some 40,000 visitors to the NDSM-Docklands in Amsterdam North every year. For a second year running, Metabolic joined forces with the DGTL team on their mission to become the world’s first circular festival by 2020. 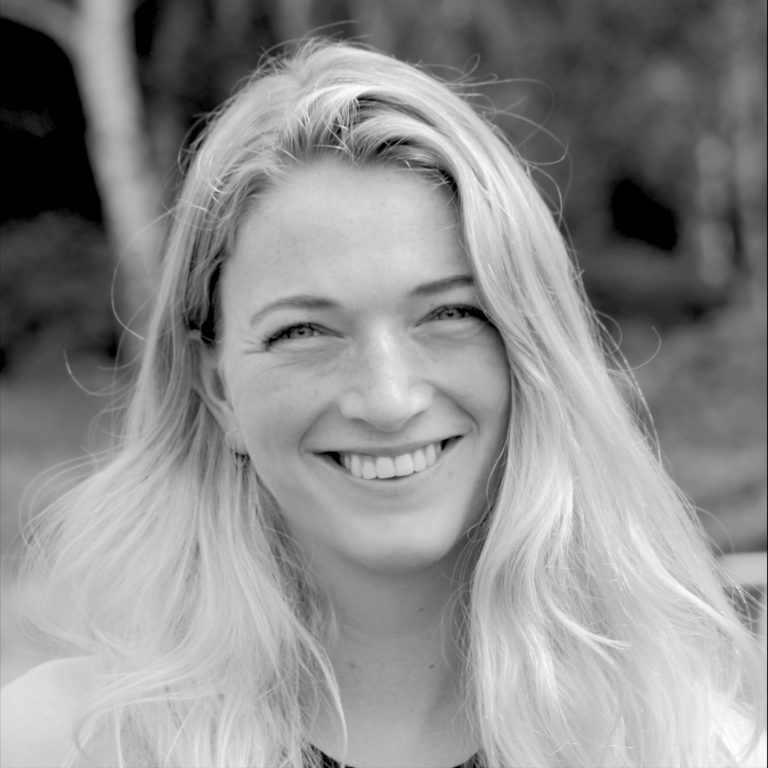 Our consultant Nadine Galle explores what this means. 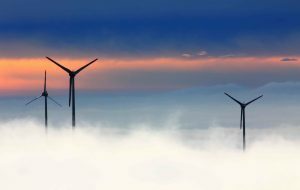 It all started with a “Green Deal”, an initiative by the Dutch government to accelerate sustainability innovation in various areas, ranging from biofuel production to electric vehicles to waste-free festivals. The latter is a close collaboration between Green Events (the leading Dutch platform for sustainable events), NederlandSchoon (foundation which fights litter), DGTL, and nine other festivals who were tired of wading through ankle-deep litter. The Green Deal is meant to encourage experimentation and stimulate knowledge sharing of best practices. Several festival success stories have already been told, such as the infamous implementation of the hard-cup rotation system and the “circular food court” (more on these later). Yet, the facilitators of the Green Deal were still stuck on one crucial question: how can we measure the progress of all these initiatives? For that, they came to Metabolic. Metabolic got its name for the way we map the metabolism of a system. 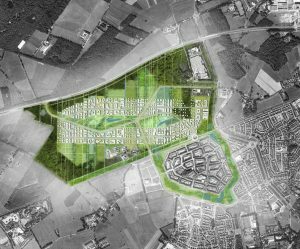 A system can be a sector, province, city, neighbourhood, or even a festival, as long as its temporal and spatial boundaries are clearly defined. Festivals make the ideal model organism in this regard, as they only last for a short period and are fenced off, meaning we can figure out exactly what is coming in – and what is coming out. 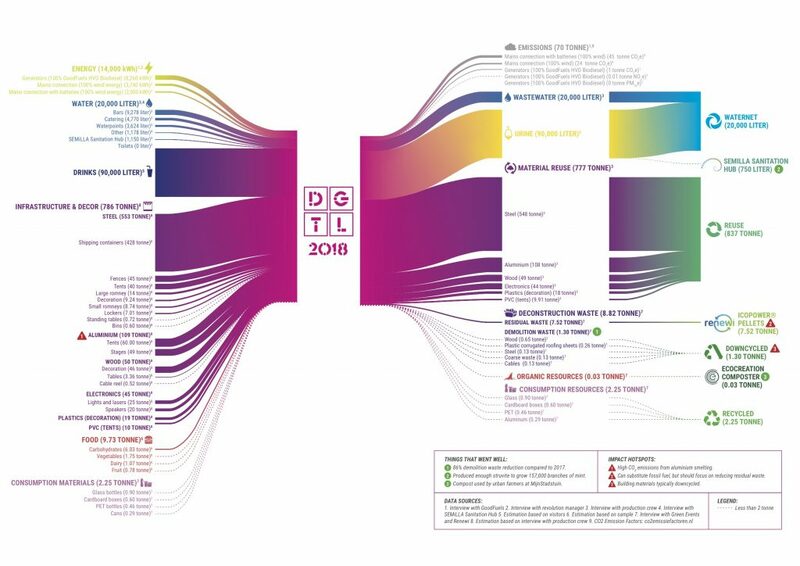 After getting a partial view of DGTL’s metabolism in 2017 – where the scope of our study was confined to material and waste flows – we were eager to map DGTL’s full metabolism in 2018. After all, circularity is much more than just recycling materials. And so for DGTL 2018, we were excited to be able to quantify the flow of materials, energy, and water on the festival terrain, the different kinds of environmental impacts these flows are associated with, and the carbon footprint of artist and visitor travel. The method we use to do this is called “Material Flow Analysis” (MFA), which is always depicted as a Sankey-diagram (see below) and is read from left (inputs) to right (outputs), which helps to visualize the different resource flows and their sizes. The lines in the infographic are scaled to represent the total mass of the resource flows consumed, reused, or disposed of at DGTL. Since some flows are significantly bigger than others there are some exceptions to the scaling rule, such as the representation of water flows, which have been scaled down. Red callouts on the infographic point out selected areas of high environmental impact, while the green callouts present possible opportunities associated with the different resource flows. Mapping a festival’s metabolism for a single year can provide insights on where to focus one’s sustainability efforts for the next, but mapping a metabolism over multiple years offers a solid evidence base for comparison. 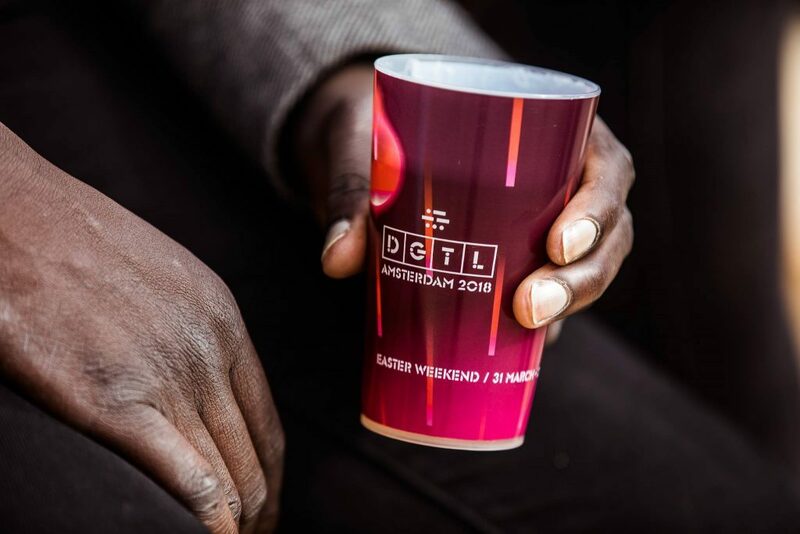 Based on learnings from its 2017 edition, this year DGTL made a number of fundamental changes to the set-up and operation of the festival, which had significant impacts on its circularity performance. The hard-cup system asks festival goers to pay a deposit for their cup, which incentivises them to return it instead of throwing a single-use cup on the ground after use. The system was better communicated this year and offered greater success rates in decreasing plastic waste. Within the Green Deal, festivals have also started experimenting with biodegradable disposables, a well-intentioned initiative, but, like DGTL in its first year, most festivals lacked the proper infrastructure to deal with this new waste stream, resulting in even more residual waste (read my Five guidelines to a circular festival for more on this issue). When handled properly, however, biodegradable disposables have shown great potential in drastically reducing paper, plastic, and even worse – styrofoam – waste. To ensure success, LabVlieland (island sustainability platform who test their ideas at ‘Into the Great Wide Open’), in collaboration with DGTL, have designed the “circular food court”, which strives for zero-waste. At DGTL, the EcoCreation composting machine enabled this ambition by converting all food waste and biodegradable disposables into usable compost within 24 hours. The composter is at the core of the circular food court, both figuratively and literally. Allowing visitors to dispose of their food waste into the composter themselves adds to their awareness and challenges festival goer stereotypes (who are typically portrayed as drunk, littering messes). As a result, DGTL produced virtually zero food court waste this year, even though they produced over 2.5 tonnes last year. In 2017, we saw that the most waste from festival goers originated from food and drink packaging. With the hard-cup and biodegradable disposable successes, DGTL visitors cut their waste in half from last year. 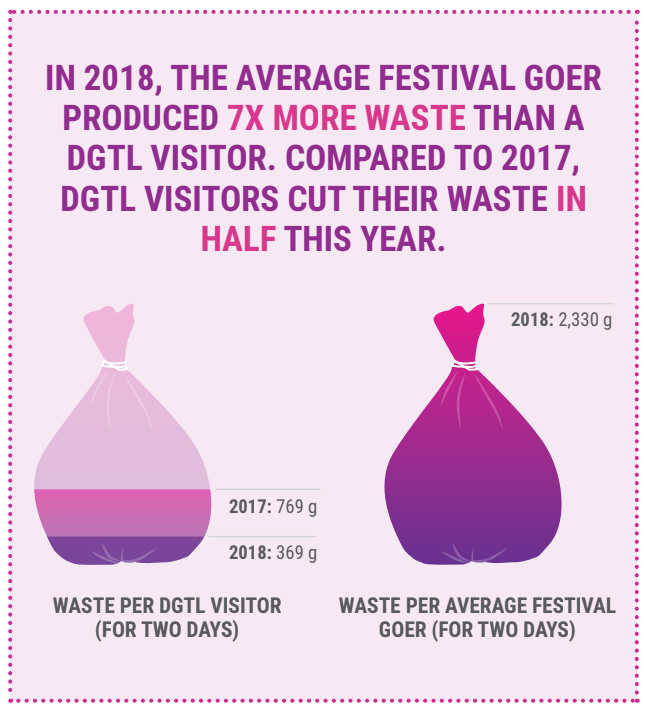 So much so that in 2018, the average Dutch festival goer produced seven times more waste than a DGTL visitor. The waste that is collected becomes the resources for new products. As such, DGTL has moved away from waste collection areas, which are typically tucked away behind- the-scenes, to a “Resource Street”, which is central for all visitors to see. The Resource Street consists of a recycle hub and a new technique called pyrolysis. 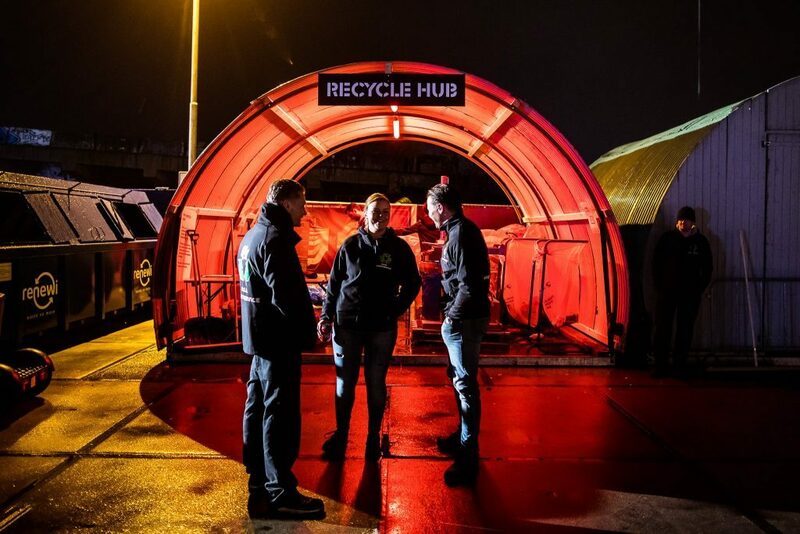 The recycle hub works to separate all visitor waste, so the new “resources” can be picked up for further use. The pyrolysis installation turns bottle caps into oil, which in turn can be used to make new plastic. The most valuable component of the Resource Street is that it allows visitors to discover the value of their own waste and change the narrative from “waste as a problem” to “resources as a solution”. One of the biggest success stories of DGTL 2018 was one the average visitor wouldn’t see: design for disassembly. Last year, DGTL produced just under 10 tonnes of demolition waste, mainly from stages and decorations that were built in a “linear way” (take, make and waste the material). Design for disassembly is a process by which products are designed with ease of assembly in mind. It is rooted in DGTL’s DNA; the festival even named one of its stages “modular”. While demolition waste (read: building materials) are reused at the end of their life cycles, this is usually achieved by downcycling (e.g. using broken concrete as filler), rather than recovering the materials for reuse at a high value. In a truly circular festival, all materials bought, sold, or used on the festival grounds – from infrastructure to food – are destined for high-value reuse. This means that 100% of waste is collected and processed for recovery back into either economic or ecological cycles. Incineration with energy recovery (e.g. ICOPOWER® energy pellets) is only applied to highly degraded or biohazardous products that cannot be treated in any other way. Products and infrastructure are designed in such a way that materials can be easily disassembled, reused, and recycled – preferentially first as whole products, then components, and finally as raw materials. This year, due to mandatory reuse regulations, design for disassembly, and strict enforcement, DGTL decreased its demolition waste by 86%. The significant reduction is not only impressive, but also shows the autonomous nature of festivals and how a focused, dedicated team can make true impact happen in just one year. These are just some of the ways DGTL is dominating festival sustainability and setting the bar for others to follow (or exceed). To achieve full circularity in 2020, there is still a road ahead. Being a frontrunner in modular design and opting for reusable and recyclable materials wherever possible, DGTL must begin to consider toxicity of material reuse. 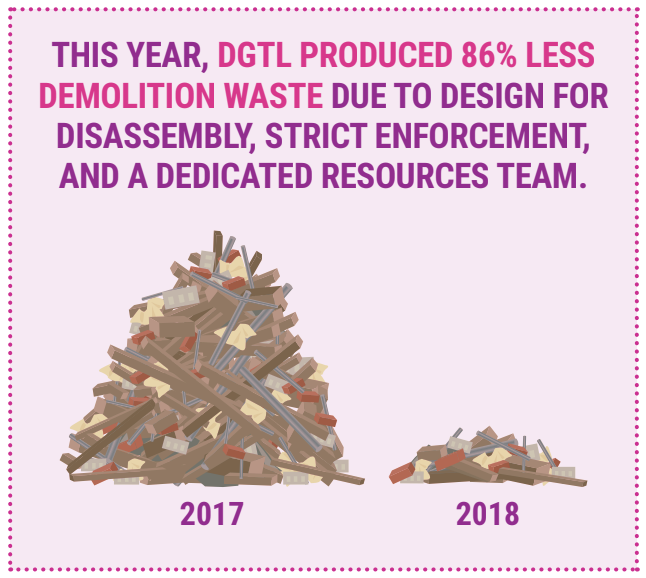 Also, DGTL’s pioneering design for disassembly has already significantly reduced demolition waste, but the 1.3 tonnes that remained could be eliminated next year with even stricter enforcement. The volume of residual waste (e.g. textiles, chewing gum, non-recyclable packaging) remained stagnant from 2017 to 2018, showing little innovation in its reduction. To inform this reduction, further analysis of both the festival’s procurement and consumer waste behaviour should be executed at future editions. 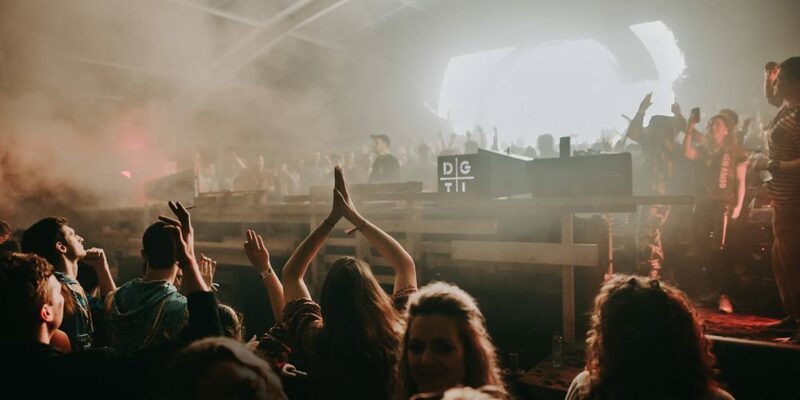 Circular festivals go beyond just materials and waste, and the opportunity to take DGTL’s energy and water flows into account this year has given us a much more holistic overview of the festival’s metabolism. That being said, the need to report a detailed breakdown of water use was new for DGTL. In the future, we suggest multiple water meters to gain a better understanding of how much water is used for what to better inform water savings. And while the energy supply is as good as it can be, under the current restrictions with the NDSM-Docklands’ mains connection, measures can be taken to reduce energy use. However, we now have a more comprehensive base for comparison of energy and water flows next year. Until then, I encourage you to read the report summary, be critical, and get inspired.